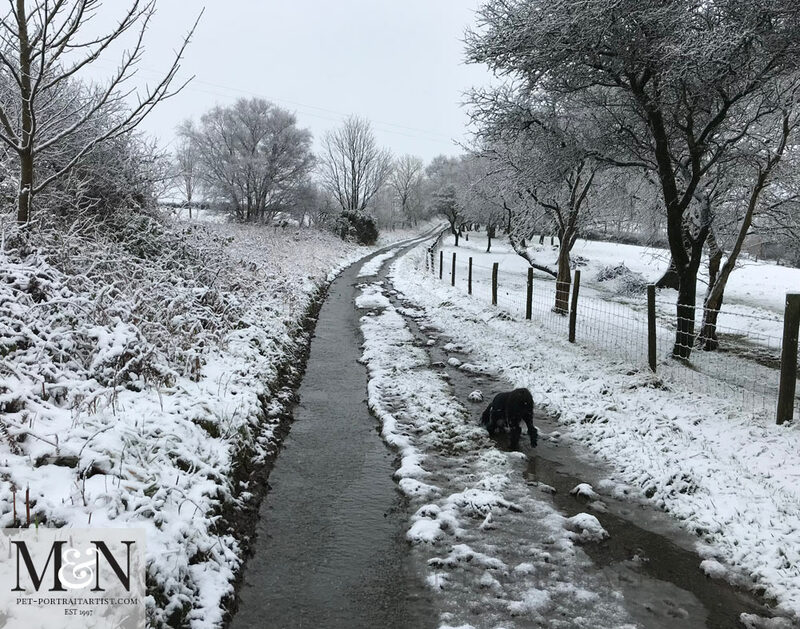 We have had a very pretty fall of snow here in Wales. We thought we would share a few photos with everyone. 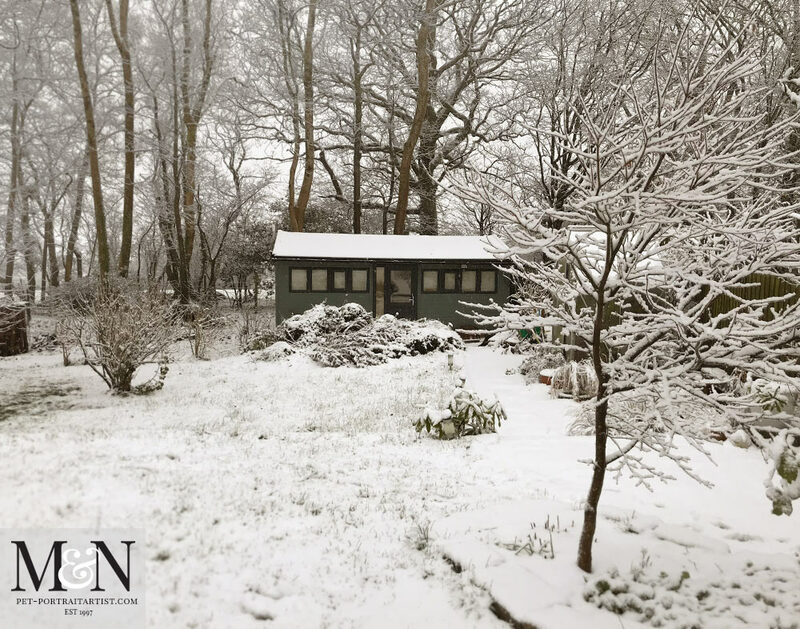 The first photo is one of our studio nestled down in the garden between the snowy trees. Everything looks so pretty when it has snowed. We then took Lily out and about down the lane and took a few photos of our surrounding area. It has been many years since we have had a proper snowfall. Perhaps due to climate change, our weather is mostly mid temperatures and rainy most of the year around. So its always nice to see a sprinkling. As much as it is nice to see it, it is always lovely to have solid ground back a few days later. The best of both worlds! Lily thorough enjoyed herself and hurtled around the garden. 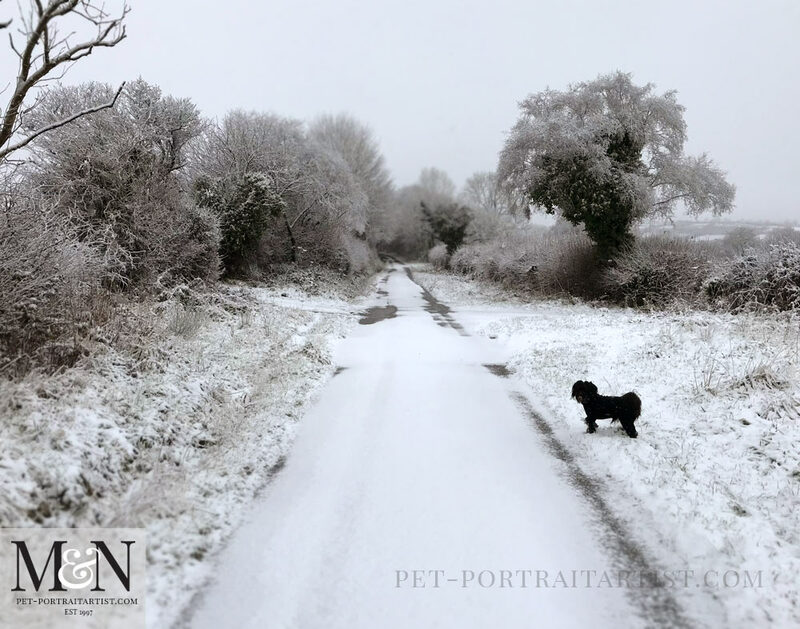 She has long fur and her double coat does tend to pick up the snow in clumps. I defrosted her in the kitchen sink twice yesterday! The funniest photo was after being out in the garden in the dark, snuffling around in the snow. Take a look at the photo below…..so comical. She makes us laugh every single day! 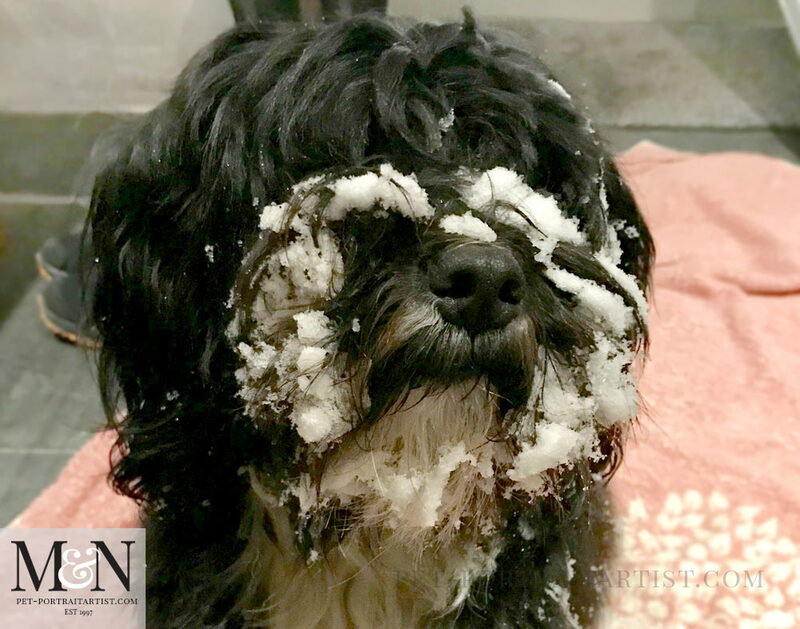 We called the photo Abominable Lily……. omg what a cute doggy! She looks like she is having such fun, thanks for sharing! Very pretty. We had snow here in Atlanta last week and I’ve always loved how beautiful it is. It covers up lot’s of ugly stuff in my case. Always look forward to your newsletter every week. I am so thrilled you look forward to our newsletter Donald. That is wonderful news! Hopefully plenty more newsletters to come in 2018! Wishing you and your family a wonderful festive season in Atlanta. Thank you for sharing such enchanting photos. They truly embody the holiday season. Warm Regards. Hi Pam, Thank you so much for your lovely comment! So pleased you enjoyed viewing our photos. Wishing you and your family a lovely festive season and all the best for your artwork in 2018!